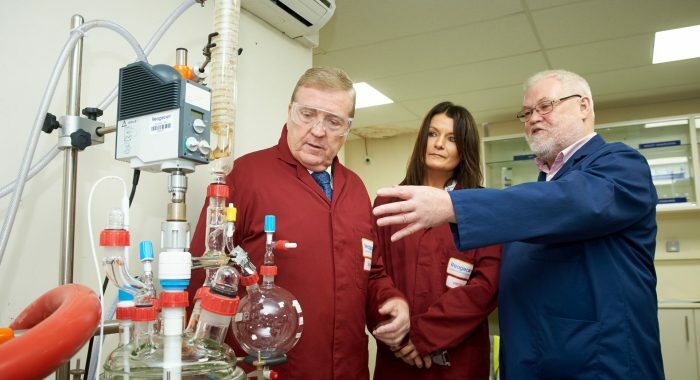 Pat Breen, Minister for Trade, Business & Employment and Helen Downes, Shannon Chamber CEO are shown around the facility by John Barron, managing director of Reagecon Diagnostics at the launch of Reagecon’s new product range for Life Sciences, Environmental and Geology markets. Reagecon, based in Shannon, is the world’s largest producer of physical and chemical standards. Shannon Chamber member,Reagecon, the world’s largest producer of physical and chemical standards, has today announced the launch of a suite of new and innovative products for the life sciences, environmental and geology markets. This brings the total number of products developed by Reagecon’s workforce of 100 people (50 of which are chemists) at its Shannon facility to almost 10,000. Reagecon’s products are used to calibrate scientific instruments across a whole span of different industries that include pharmaceutical, food, environmental, paper production, beverages and niche areas such as petrochemicals and biofuels. Today’s launch will significantly increase its penetration potential into life sciences, environmental measurement and testing and geological testing. In tandem with the introduction of these new products, and to enable Reagecon more effectively reach its disperse customer base in 175 countries worldwide, the Company has also launched a new innovative eCommerce website (www.reagecon.com). The delivery of this new range of products has resulted from an acceleration of Research and Development (R&D) activity by the Company, involving an investment of €4,000,000 over the past six years, supported by Enterprise Ireland. The ecommerce launch is the culmination of a significant investment of resources in both website and webshop development. Reagecon’s founder and managing director, John Barron, speaking in Shannon today, said: “The products being launched today, targeted at the life sciences, environmental and geology markets, give us a significantly greater footprint in several new markets and in particular in the rapidly growing life sciences market. The resources expended on our new eCommerce site recognise the growing importance that we attribute to this form of sales and marketing and reflects our belief that ecommerce will play a major part going forward in the scaling efforts of the company. “Reagecon’s leadership team believe that our R&D, ecommerce and state-of-the-art manufacturing, all underpinned by innovation across every function within the company, will enable us to maintain our market leading position and enable us to scale at a very rapid rate between now and 2022. Reagecon is the world’s largest producer of Physical and Chemical Standards, with sales in 175 countries worldwide. The company is based in Shannon, Ireland and has a sales office in Shanghai. The company operates from a 64,000 sq.ft. (6,000 sq. m.) state of the art facility, that includes a large suite of Manufacturing, Quality Control and Research and Development laboratories, and employs 100 people, 50 of which are chemists. The company produces almost 10,000 different products.